The temples of Bangkok are the main sights of the City of Angel. Imagine, more than 400 of these Wats adorn the cityscape and many of them are among the top sights of the capital. 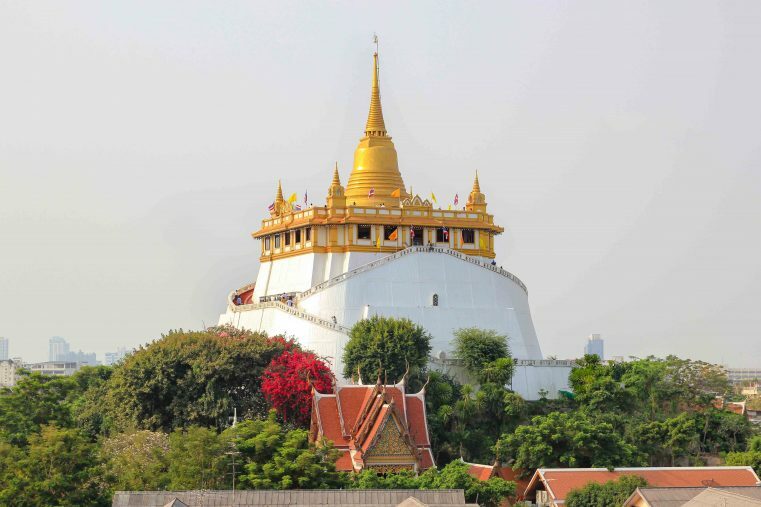 Of course, the choice of which temple to visit in Bangkok is not that easy and a trip to Thailand won`t be complete without seeing at least a couple of them. We have listed the best and most famous temples including pictures, opening hours and entrance fees. In addition to the usual visitor magnets, we also reveal some insider tips and show some temples that certainly not everyone knows. As a little extra, below you will find useful tips on which clothes you should wear in the temples of Bangkok and what the rules are for a temple visit. 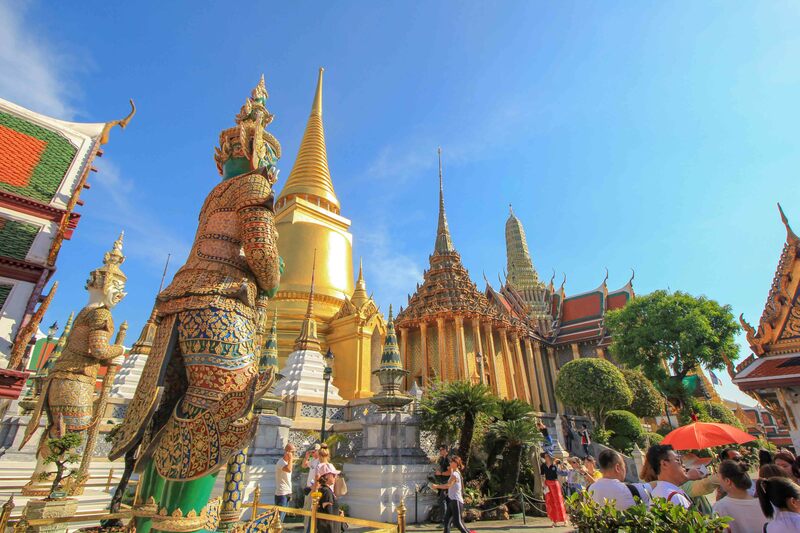 Wat Phra Kaeo, also called the Temple of the Emerald Buddha, is undoubtedly the most famous and, as for many, the most beautiful temple in Bangkok. The huge temple complex is located inside the grounds of the Royal Palace and a visit is almost a must do on any Bangkok trip. Here you can`t stop marvelling: golden chedis, breath-taking ornaments and glittering statues as far as the eye can see. The heart of Wat Phra Kaeo is the Emerald Buddha. Interestingly, the small 66 cm statue is made of jade and 3 times a year, depending on the season, the robes of the Buddha are changed. 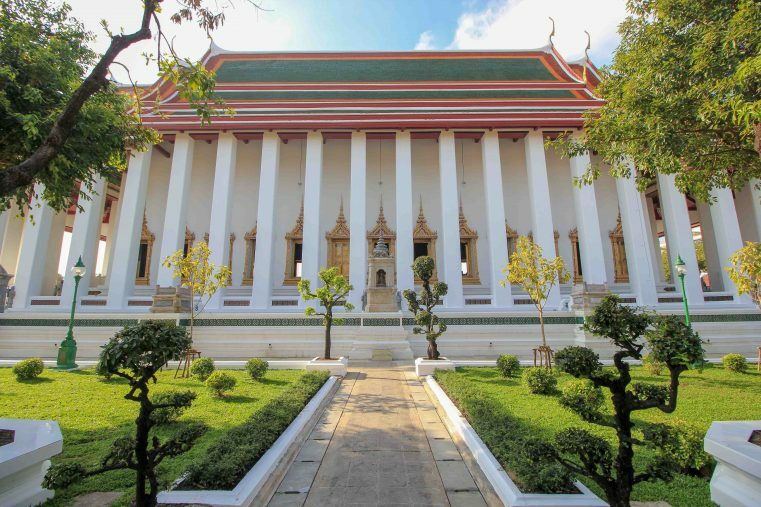 Opening times: Wat Phra Kaeo opens daily from 8:30 am to 3:30 pm. Entrance Fee: 500 baht Admission Fee – the price includes entrance to Wat Phra Kaeo and the Royal Palace. On an extensive temple tour through Bangkok, of course, a visit to the Wat Pho should not be missed. Like most of Bangkok’s worth seeing temples also the Temple of the Reclining Buddha is located right in the city center. 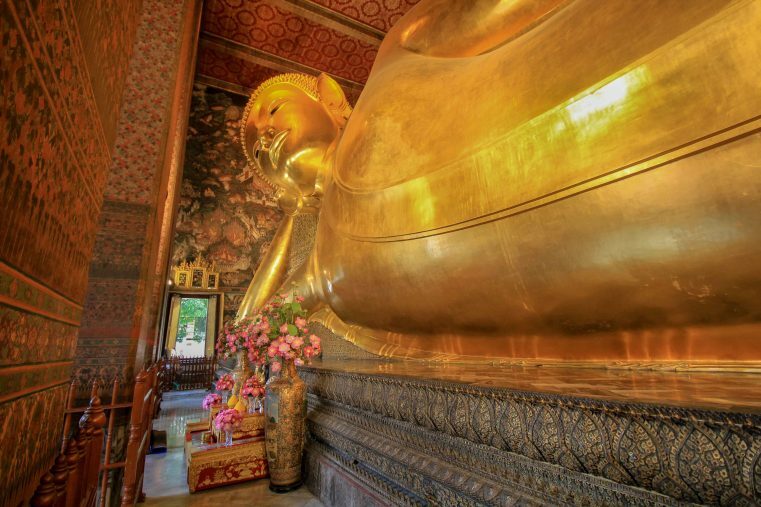 The main attraction of the Wat Pho is the huge approximately 46 meters long and 15 meters high golden reclining Buddha. But also the other Buddha statues and the colorful Chedis of this temple will take your breath away. Tip: Spoil your tired feet with a massage! Inside of the Wat Pho temple complex you will find one of the most famous massage schools in Bangkok. Opening times: Wat Pho is open daily from 8 am to 6.30 pm. 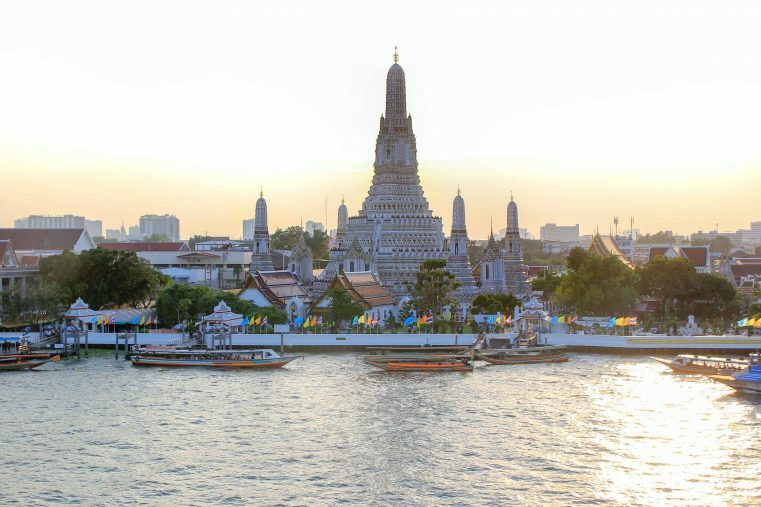 Wat Arun, also known as the Temple of the Dawn, is one of the most famous temples in Bangkok. It is located on the west side right of the river and is easily accessible by ferry from Tha Tien Pier. Even the boat tour to get there is an absolute highlight and from the ferry you will have the opportunity to take some great temple pictures. The stunning white temple complex is adorned with shining mosaics of shells, glass and porcelain, which form charming floral patterns. Especially at night, when the lights are on this temple looks really amazing. Tip: Watch the sunset right on the shore off the river! The scenery is amazing, and the Wat Arun sunsets are some of the best in town. Here you will find more about Wat Arun. Entrance Fee: If you want to visit the Phra Prang the admission is currently 50 baht. The visit to the rest of the Wat Arun facility is free. The Wat Traimit, or better known as the Golden Buddha Temple is really worth seeing and is located in Chinatown. In the temple there is a 5.5-ton Buddha statue which consists for the most part of pure gold and this buddha is the actual main attraction of the temple. The value of this statue is estimated to be more than $ 250 million. 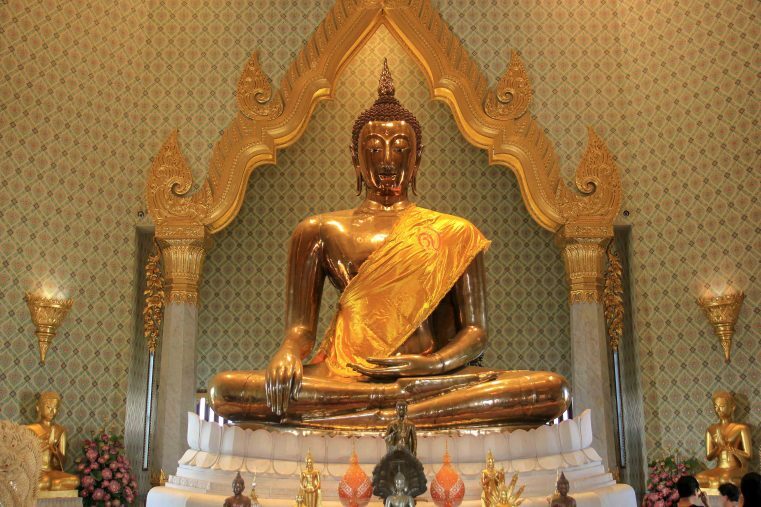 Although the Wat Traimit Temple is impressive, just the Golden Buddha alone is worth a visit. Tip: Visiting the Golden Buddha Temple can easily be combined with a sightseeing tour in China Town. The Wat Benchamabophit, probably better known as the Marble Temple, is a real highlight in Bangkok and another must-see. The contrast between the white marble and the golden ornaments is fascinating. Especially photographers will enjoy their visit to this temple. The Italian marble and an incredibly special design make this sacred site so special. The garden of the complex is a small oasis in the middle of the sometimes so chaotic Bangkok. Here you can enjoy the quiet ambience and the beautiful bridges also offers great photo opportunities. Tip: If you visit the marble temple in the morning just after opening, you will usually enjoy the temple complex almost all to yourself! Opening times: From 08:00 am to 5:30 pm, open daily. The Wat Ratchanatdaram is located in close proximity to the famous Golden Mount Temple and impresses with its unusual design and an incredibly peaceful atmosphere. The white-shining temple has 37 golden chedis, which shine fantastically beautiful as soon the sun is shining. Also inside, this sacred site is worth seeing and from the top you have a great view over the rooftops of the city center. 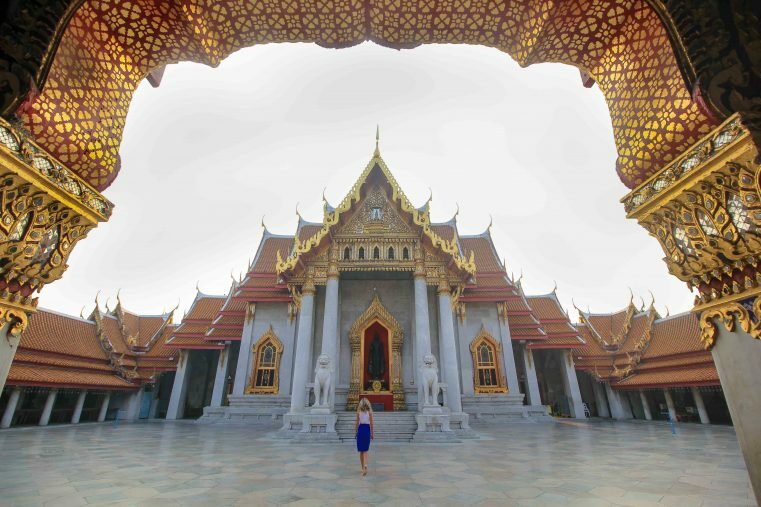 If you are up for a temple tour through Bangkok, don`t miss this place! 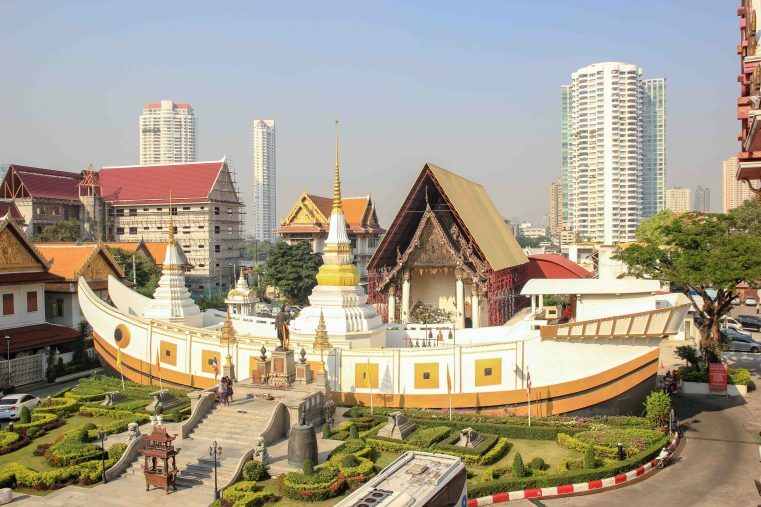 Located in the city center, Wat Suthat is one of the largest temples in Bangkok, covering approximately 4 hectares. This sacred place is away from the tourist crowds and so it is usually very quiet and idyllic. Particularly beautiful and impressive are the long corridors with all the golden Buddha statues. The mood is unique at Wat Suthat and so it’s a wonderful temple to spend some tranquil time. 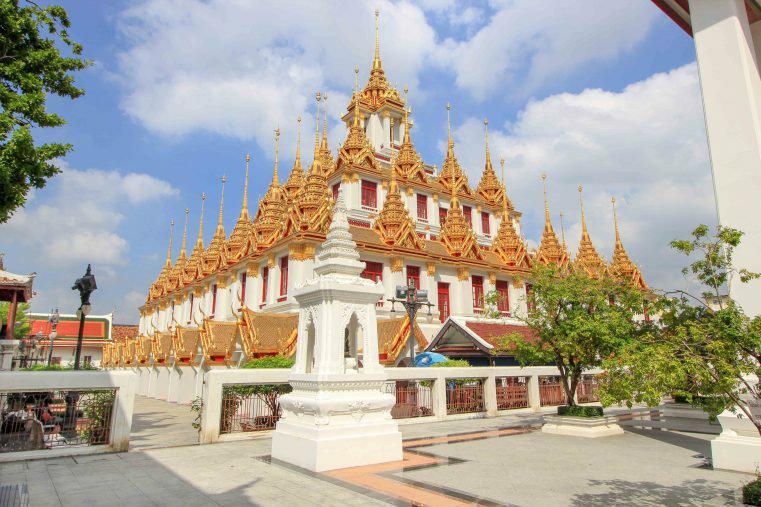 This gem is one of our favourite temples in Bangkok and should not be missed on an extended temple tour in Bangkok. Tip: Nearby is the “Giant Swing“, another top sight of the city. 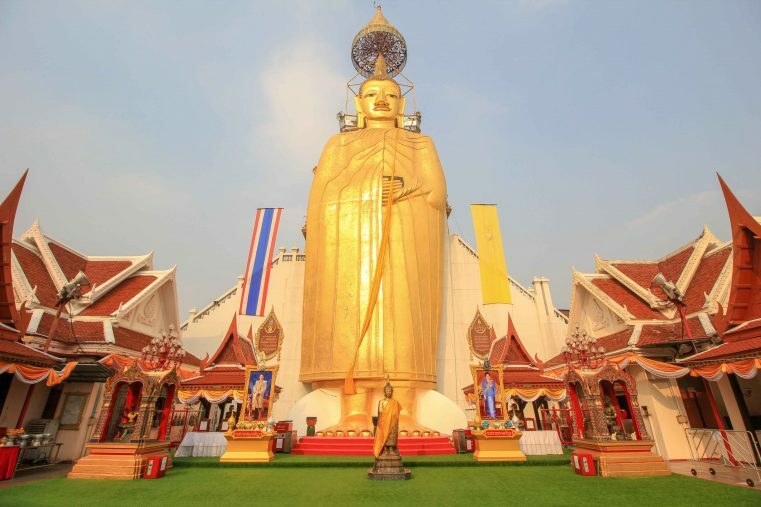 The 32-meter high standing Buddha in Bangkok, also called Luang Pho Tho, is the main sight of Wat Intharawihan. Compared to other temples in Bangkok the Standing Buddha temple is rather small and quieter but not less worth visiting. Here you can have look around, light some incense stick and enjoy the beautiful Buddha statues and the meditation room. The Wat Phra Dhammakaya is located a bit outside of Bangkok (north) and is an absolutely hidden temple in Bangkok. It is the largest temple in Bangkok area and a real insider tip. The temple complex is one of the largest Buddhist temples in the world and on Buddhist holidays it is used by the eponymous meditation movement for mass meditation. Also, the design is really unique, and it somehow reminds of a golden UFO. Absolutely recommendable is the visit of this gigantic temple during one of the bigger Buddhist holidays. 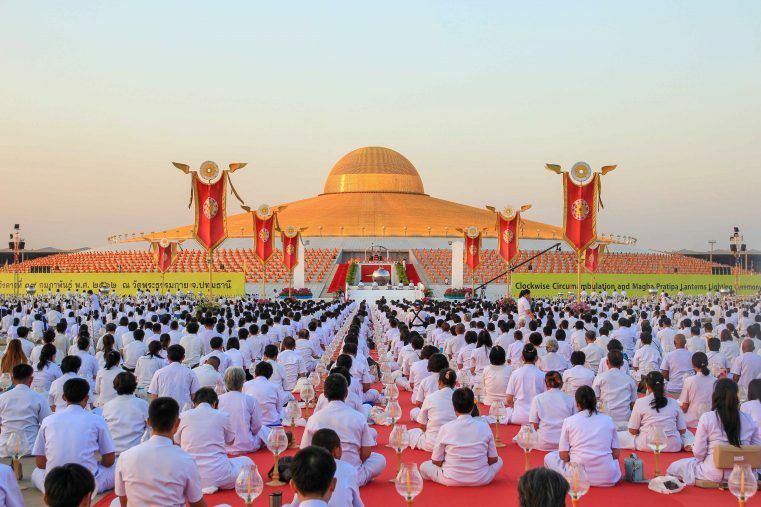 At this time, more than 100,000 believers from all over Thailand come together for communal meditation. The Wat Phra Dhammakaya is a real insider tip for Bangkok and definitely recommended if you are looking for exceptional places. Wat Yannawa is a rather hidden temple and if you love temples it is really worth a visit! The unusual shape of a ship or boat is a true eyecatcher and can give some great holiday shots. The temple is beautifully situated right next to the Chao Phraya River and so you can enjoy great river views during your visit. The Wat Yannawa is still an insider tip among Bangkok connoisseurs and we were very impressed by this sacred site. This temple is located near the BTS Station Saphan Taksin. Entrance Fee: Until today, the entrance to Wat Yannawa is still free. Dresscode: When visiting a temple, proper attire is a must. What to wear: With short trousers, provocative skirts or even swimwear you won`t be allowed to enter a temple. Nevertheless, mostly you can borrow appropriate clothing for a small fee in the entrance area. If you are not sure just take a cloth for the shoulders. Long pants are not a must, but the knees should be covered (especially for women). Closed shoes as well as sandals or flip-flops are allowed. Rules: Inside of temples always walk barefoot, but do not worry, signs will remind you. Mostly you can move around freely and take pictures, just be careful to be quiet. You can also stay a while and sit on the ground, just be careful that your soles are not pointing in the direction of the Buddha. Finally, you have to know that a monk is not allowed to be touched, this is especially important for women.